How moments invisible to naked eyes can be revealed through different means, like human body and technology? Waiting line is about investigating brief time horizon, capturing and reinterpreting through prototype design methods. 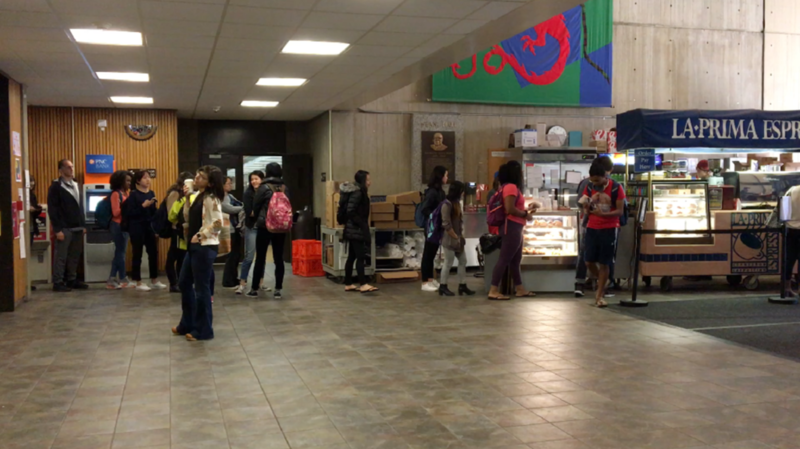 Here, I analyzed, reinterpreted observation and data, and redesign the waiting line in La Prima coffee stand located in Wean Hall, Carnegie Mellon University. Uncomfortable line-cutting and direct traffic happens at La Prima coffee stand. One line of yellow tape was put down to create barrier and guidance path. However, the intent to integrate the intervention in the environment was too subtle. Two lines and an arrow of yellow tape was put down to emphasize the path guidance. The intervention worked, ordering line intersection was cleared and physical barriers and conflicts were removed.